Facebook is poised to roll out a sweeping new redesign that places a significantly stronger emphasis on user privacy. The new features will begin to appear for the web app’s users on Thursday, with mobile application updates coming in the weeks ahead, Facebook VP of product Christopher Cox said in an interview this week. The wide-ranging redesign is aimed at giving users more visibility into what they’re sharing and with whom. “The goal is to have every single person who uses Facebook be able to answer the question of: Who is able to see this thing I’m sharing right now?” Cox said. The general theme behind all the new features is that they bring privacy controls into the Facebook experience itself, whereas before they had largely been hidden several clicks into Facebook’s settings menus. Users will be able to choose to approve or reject any photo or post they’re tagged in before it shows up on their activity stream or profile page. Before, photos users were tagged in would show up on their profiles as soon as the tags were added. Users will also be able to control who can tag them at all. 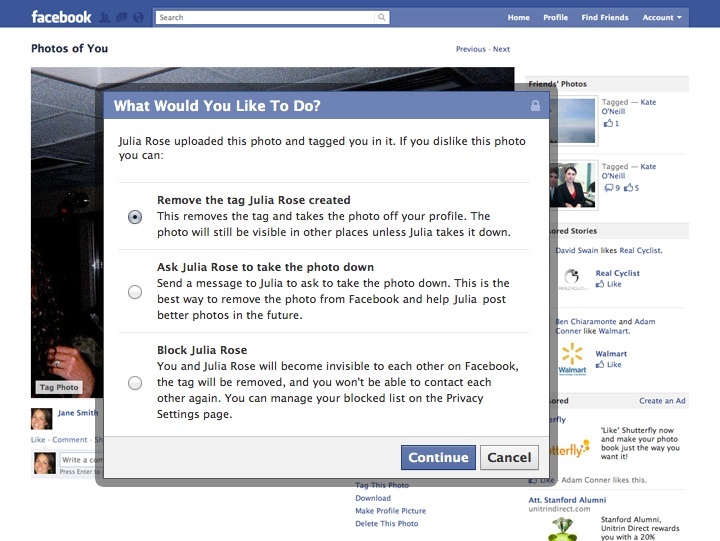 If someone is being harassed by being tagged in photos they don’t want to be involved with, they can ask the user to remove the photo, or permanently block the user from ever tagging them again. Now each and every post a user makes on Facebook — from adding photos to status updates — will be accompanied by a drop-down menu that allows her to decide with whom to share it. The drop-down menu will soon expand to include smaller groups created by each user, Facebook says. When a user is viewing his own profile, each piece of content will appear next to a drop-down menu letting him know who can see this part of his profile. With one click, users will be able to calibrate who can see information from their hometowns to their latest photo albums. The button that allows users to see how their profile appears to other people is now at the top of each profile; before it had been buried within the privacy settings. I wish we could move that quickly on something like this! I wish we could do all this stuff in a month. We’ve been talking about these changes and implementing them for at least six months. We get feedback that our privacy controls are sometimes hard to use, and we’ve been thinking for a long time about the key structural things we can do to eliminate the confusion. Even so, this does represent a bit of an about-face for Facebook, which has historically worked to expand users’ comfort zones in regard to what they wanted to share on the Internet. Mark Zuckerberg has famously gone on record saying that people have generally become more open to sharing things publicly in recent years, and that his company’s policies are meant to reflect and encourage that. This latest redesign, which makes it much easier for Facebook users to restrict public access to things they post, seems to be a fairly major change from the company’s past policies and stated philosophy. And although Facebook executives have dismissed Google+ as a non-threat, Facebook has certainly showed a renewed zest in shipping new products and features in the weeks since Google’s social network launched. As my colleague Mathew Ingram wrote recently, “It seems clear that the competition is keeping Facebook awake at night — which may be a good thing.” As Facebook and Google duke it out for consumer loyalty, they’re both bringing their best efforts to the table as quickly as possible — and the real winners will be the millions of social media users across both platforms. This is probably good for those of us who have grandparents and others as facebook friends but who we do not want seeing certain updates and photos! I don’t know about Google+, but it was never going to outdo FB. Thanks for the comment, John — it certainly is fun to watch both companies be “on the ball” right now. “The drop-down menu will soon expand to include smaller groups created by each user, Facebook says.” Did they use the term ‘groups’? If they did I almost wonder if they will be phasing out ‘friend lists’ (groups you can create that only you can see to manage privacy). I believe they did use the word groups, Liz. Good eye, and thanks for chiming in! I’ll certainly be watching that closely going forward. Facebook made nearly all needed fixes user tests revealed in the realm of privacy. http://gigaom.com/2011/08/23/facebook-privacy-redesign/ vs http://bit.ly/p67UzX They should run more usability tests, themselves, right from the start. I’m not technically a usability expert, but was able to draw clear conclusions instantly from watching real user videos. Facebook’s new release seems very “reactionary” given the timing and the founder’s previous stance that encouraged public sharing. I think this was a good thing. Good leaders have a vision, and great leaders are able to sometimes step back and deliver what the people want. A couple days work and Google+ has been made irrelevant again.